There are three things that set 4Pane apart from other file browsers: speed, lack of bloat, and a four pane interface. Indeed, 4Pane is lightning fast, and this quality alone makes it a worthy alternative to whatever file manager you currently use. A complete lack of fancy trimmings means that 4Panes lets you focus on what's important (i.e., managing files), while the four-pane interface gives you a lot of room for juggling files and directories. At first sight, 4Pane looks like a rather bare-bones file manager, but beneath its unassuming appearance hides a wide array of genuinely useful features. 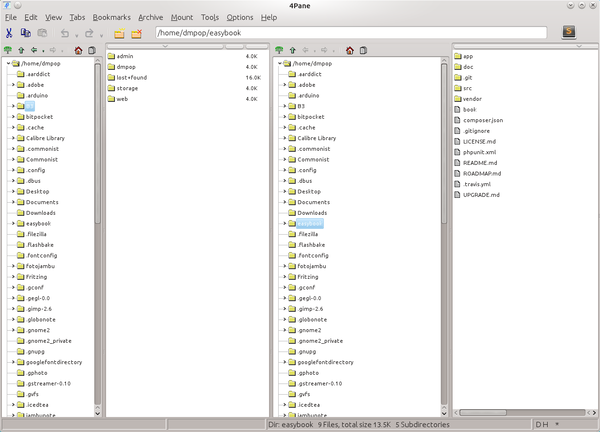 For starters, the file manager supports tabs, so you can open as many panes as you need. The bookmarking feature allows you to save and quickly access often-used directories, while 4Pane's filtering functionality can come in handy when you want to narrow the current view to files that match specific criteria. Right-click on a file or a directory, and you can access a list of commands and actions that you can perform on the selected file or directory. Better yet, 4Pane lets you add your own custom actions. For example, you can add an action for unpacking tarballs. To do this, choose Options | Configure 4Pane, and switch to the Tools | Add a Tool section. Enter the tar xzvf %f command (%f is a placeholder replaced by the currently selected file or archive), choose the existing menu or create a new one, and press the Add the Tool button. Press then Apply and Finish, and you can access the added tool by choosing the Tools | Run a Program menu. The file manager also offers shortcuts to often-used editors, and you can easily replace the default editors with your own preferred applications. Choose Options | Configure 4Pane, switch to The Display | Misc section, and press the Configure toolbar editors button. You can then add your favorite applications. These are just a few of 4Pane's highlights, and the file manager offers a slew of other nifty features that can help you to manage files and directories efficiently.